This a HD CCTV system with 5 x cameras including professional installation fully setup with mobile apps so you can view your live cameras from your phone from anywhere in the world . You can choose the type of camera (bullet or dome) and the colour from the drop down boxes below. 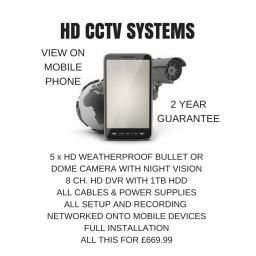 All CCTV cameras are weatherproof and come with night vision. Cameras can be networked onto any Apple or Android mobile device for remote viewing. HD cameras and recorders are far better quality than the older Analogue systems. We use both AHD and TVI HD systems if you want to discuss which one would best suit you needs before purchasing or would just like to discuss your CCTV SECURITY needs then just give us a call on 01482 869849 or 07466257081and we would be happy to help.